Athletes are often reminded to take care of their body. 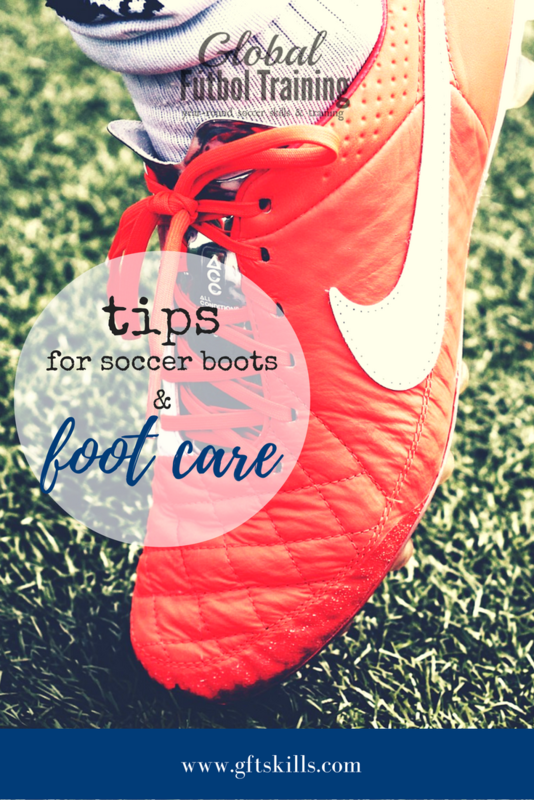 Not too often do you hear about tips for soccer boots and foot care. In this article I will teach you how to treat and prevent these painful blisters, best way to dry your boots on a rainy day, along with many other ways to keep your feet feeling good. 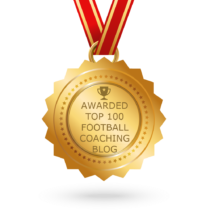 Note: This post contains some affiliate links for your convenience. Click here to read my full disclosure policy. I have included below a few of the tips and tricks I have learned traveling over 15 countries over my career, including my favorite which I accredit to ‘Dr. Flaco’ [Mauricio Segovia, Chilean national player and former teammate], who taught me how to cure a blister instantly using a sterilized sewing needle & thread. See below a few paragraphs the one titled “Needle and thread” for how to help cure your blister. Every soccer players gets blisters on their heels and bottom of their feet from time to time, especially with Your NEW favorite BOOTS. A great way to help prevent this from happening or help the pain is by simply putting Vaseline inside the heel area of your boot. You can also put it inside your sock and outside your sock which will make a mess of the sock, but is totally worth not having to deal with the pain of blisters rubbing + the socks will clean easily and it’s really not too bad once you finish playing. Blisters can be one of the most painful experiences for athletes [sometimes worse than a bone fracture] but you can’t tell your coach you’re sitting out because of a blister. TIP: when you’re not playing wear sandals everywhere during this painful time of healing, so that it doesn’t rub when it doesn’t have to. This is not for your uniform. 🙂 Should you develop the blister with the water pocket of fluid, run a sterilized needle and thread through your blister. First tie a 12 inch thread on a needle. Then put the needle & thread in and out two different holes. Once the thread goes through, the fluid/water will run out. Cut the thread close to the needle and tie the thread, making a loop. This will keep the fluid out the rest of the day(s)! The fluid buildup is what causes most of the pain so we want to keep it out. This is the single best treatment for blisters I have ever used. Use Epsom Salt: (Not for blisters) but for tired/sore feet during pre-season or tournaments. You can buy this at any grocery store, CVS or Walgreens. You sprinkle the salt in the tub and soak your feet or whole body as its good for legs & back muscles. Make sure you keep your toenails cut back because 1.) they can jam when you stop in your boots/cleats, which if you do a lot of stopping and turning you can cause your toenail to turn black and purple and die; 2.) the corners of the smaller toes can poke or even cut the inside of the larger toes if they are sharp at the corner of the nail. I’m sure every teenager – adult soccer player has lost their toe nail or seen a teammate lose one. All of us have been there… Work or play so hard on your feet, that when you take your shoes off or change shoes it feels SO Good? During times like pre-season, when you have to lace up the boots 2-4 times per day, it’s good to change your shoes or cleats from time to time. Maybe wear a certain pair for when you are doing fitness and then a different pair when you are training with the ball. If you use the same cleats or shoes for every activity or practice during these long hour times your feet feel those same rubs, instead of having a different pair to take pressure off certain areas. Same goes for adults at work who walk a lot. 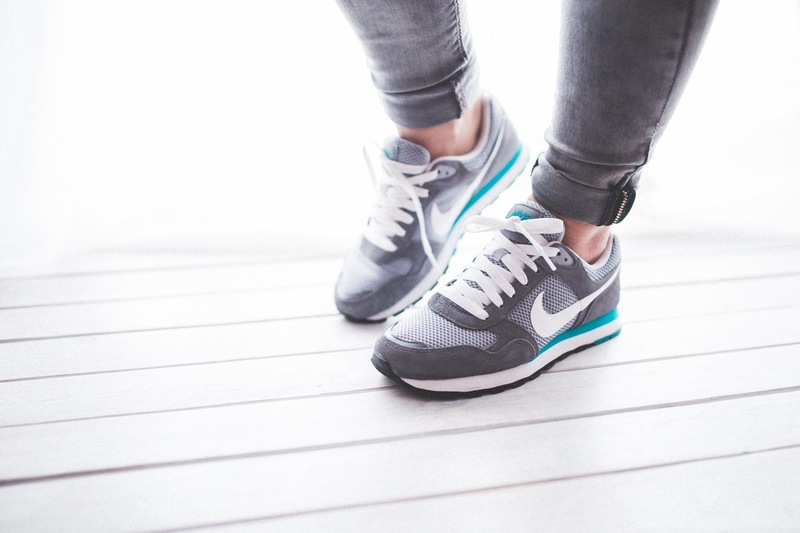 EX: Nurses should take 2 pairs of tennis shoes and change them out at lunch because it’s healthier on the body and feels better too. During times like Pre-Season, when you have to lace up the boots 2-4 times per day, it’s good to change your shoes or cleats from time to time. 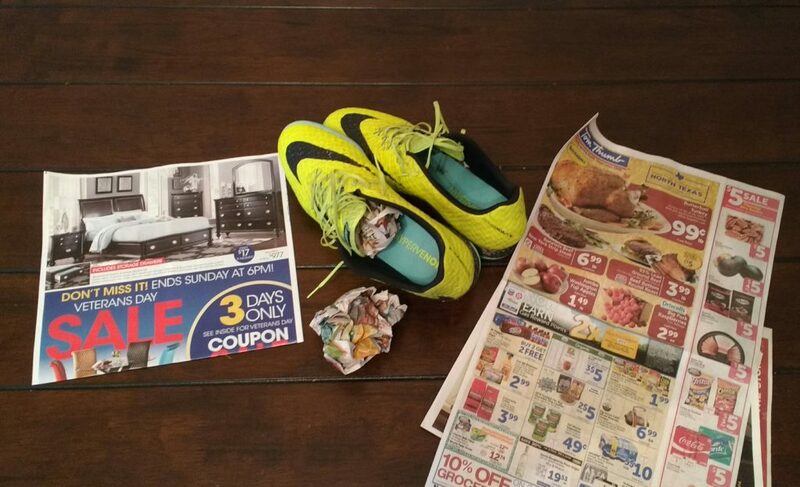 The best way to dry out your boots after playing in the rain or wet grass is by stuffing newspaper in the shoe. Just take a few pages and crumple them up and stuff down in the toe area. The newspaper will soak the water up and the next day the shoe is dry but not over-dry [still holding the soft feel that you want]. It only takes a few newspaper pages, as you don’t want too much or you will lose the shape of the boot/shoe. So keep some extra newspaper in the car or garage for a rainy day. Shoe Polish / Leather Food / Water – Depending on the boot, you want to keep them clean and polished every day or at least week. Most professional players take great care of their boots by polishing them before or after each training, preferably before, because they are completely dry at that point and it softens them up right before training or game. During the Winter Cold Days, there are 2 great ways to help feel the best you can! 1.) putting them under the car floor heater while driving to soccer. Before you put your boots on place them under the hot air vent and turn on the floor heater for a few minutes before you pull up to play and right before you pull up to play lace up the warm soft boots. 2.) If you’re a HS, College or Pro you probably have access to use the thermolator heating unit which is used for storing hot pads which are placed in a thick towel to then warm injured muscles. You can also use this to soften your boots by sticking them in for about 1 minute so they soften, warm up and lose that stiff feel of the shoe. Your trainer probably has never seen this trick so out of respect you may first want to ask them. Tell them pros & college players often put their boots in the heating unit. The units hold super-hot water and steam, so players like to stick their boots in the unit above the steam & water, for about a minute to warm & moisten right before they lace up. The boots will fit about half way in the unit, so that the heels are sticking out. Obviously being a youth player or adult player you don’t have these resources on training site, so 2-3 minutes before you arrive to the playing site, stick them under the hot air vent of the car. Make sure you lace them up while they are warm, so that they mold to your foot better. On hot turf with black or dark colored shoes it actually will make your feet hot and uncomfortable and even feel like they are burning. So think about having a white shoe or light colored shoe if you live in a very hot climate like Southern North America or South America. NOTE: With the hot sun beating on the turf which has black ground up rubber from tires, it makes the field much hotter than the temperature. So not only should you use light colored shoes but also clothes and drink extra water. Losing the big toenail: This is very common so check out how to deal with it. The #1 way players lose their big toenail is getting stepped on by a defenders cleat. OUCH! After a few days it can turn back/purple and after a few months it will fall off. What do you do if your toenail turns black & purple? Don’t panic but yes, this will cause your toenail to fall off, but not before your new nail grows in. *Interesting fact: In college & pro, many defenders wear longer cleats more than other playing positions for 2 reasons: 1.) Being the last defender you don’t want to slip and 2.) If you accidentally step on a forwards foot it slows them down for the day LOL. The #1 way players lose their big toenail is getting stepped on by a defenders cleat. OUCH! Plantar fasciitis – is a pain under the foot that even causes discomfort when walking but especially running. This is worse as you start your exercise or practice but feels a bit better as you get into the training. Simply getting warmed up and stretched out and then the adrenaline caused from the competition is going to make it easier to play. Here are 3 ways to help plantar fasciitis. RICE (Rest, Ice Compression, & Elevation) is one of the best things you can do and sometimes could be weeks or months so if you can ride a bike to stay fit while you try and rest the injury. You can also stretch the big toe to help the recovery. I found that rolling a golf ball under my foot felt relieving. From home you can do balance exercises, calf & pelvic strengthening drills. – Recent Pro athlete who had this injury was Peyton Manning – NFL Quarterback & Super Bowl Champ of Denver Broncos who was injured mid-season and came back early just before the playoffs. This happens when the big toe hyper-extends and causes pain under and to the inside of the big toe. Former NFL star (Dallas Cowboys) Deion Sanders had this injury. They say that fast players often get this because when they take off to sprint it hyper-extends. This injury can also happen on slippery surface or uneven fields. I personally had this twice [1st in college on a thick grass field and 2nd in Curacao on an old school astro-turf field with sand sprinkled on it] and both times I never felt any initial pain. It was more where I felt the pain like it was just any minor sprain, but then it just gets worse minute by minute. I recommend you order a metal insole and if you can tape/wrap it but it’s not easy. Google ‘metal insole’ to find what you want but this is light and less flexible so it helps your foot/toe to not hyperextend as you play. If it is off-season I recommend that you rest it till its 100% and find a bike and swimming pool to get your workout in. If its mid-season you might have to tough it out. 🙁 This could take 3+ Months to heal! Pain on the heel especially in the mornings as you get out of bet, that can happen to young kids or older people. You can stretch the Achilles tendon to help and even try warming it up before you stretch it. This can help relieve some of the pain, plus give you a better stretch. ***Consult with a Dr. on all injuries and remember I am not a doctor; just a player who had injuries and wants to share my experience playing soccer word-wide.